Detail of mural by James Doolin inside Metro HQ lobby. 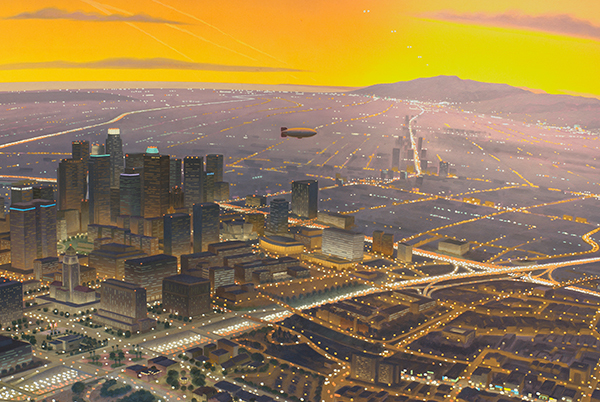 Four murals comprise the artwork, titled Los Angeles Circa 1870, 1910, 1960 and after 2000, which features the evolution of transportation systems in Los Angeles. The Metro headquarters building opened 20 years ago this week, and along with it came several new artworks to brighten the public spaces in and around the building. The HQ is connected to Union Station East, and the artworks are located within both spaces and spread around Patsaouras Bus Plaza. Come on down to Union Station and take yourself on a little art tour. Better yet, come on one of ours, led by enthusiastic Metro Art docents! Details on our free tours may be found here. City of Dreams, River of History by Richard Wyatt, created in collaboration with May Sun. This multimedia work includes an allegorical “river,” tile benches and bronze paving inserts. City of Dreams, River of History by May Sun, created in collaboration with Richard Wyatt. This multimedia work includes an allegorical “river,” tile benches and bronze paving inserts. A-Train by Bill Bell produces hidden images and sound with certain coaxing. ReUnion by Kim Yasuda and Noel Korten. Elegant metal and glass bus shelters in the bus plaza incorporate ideas about movement, evolution and change. Guardians of the Track by Michael Amescua. Cutouts in metal railings, screens and grills throughout the bus plaza and the Metro HQ building depict mythological figures and symbols. La Sombra del Arroyo by East Los Streetscapers. Handpainted tiles and bronze sculptures depicting flora and fauna are found under the bus plaza pedestrian bridge. Paseo Cesar Chavez by Elsa Flores. Locaed at the corner of Cesar Chavez and Vignes streets, each of three water fountains was designed to have a different sound; each is clad in colorful handmade tiles. Paseo Cesar Chavez by Roberto Gil de Montes. Located at the corner of Cesar Chavez and Vignes streets, each of three water fountains was designed to have a different sound; each is clad in colorful handmade tiles. Paseo Cesar Chavez by Peter Shire. Located at the corner of Cesar Chavez and Vignes streets, each of three water fountains was designed to have a different sound; each is clad in colorful handmade tiles. Detail of Los Angeles Circa 1870, 1910, 1960 and after 2000 by James Doolin. A series of four murals in the Metro HQ lobbies feature the evolution of transportation systems in Los Angeles. La Dialogs by Margaret Nielsen. This mural, in the Metro HQ cafeteria lobby, chronicles Los Angeles’ history. Epoch by Patrick Nagatani. A photo collage mural in the Metro HQ Boardroom lobby presents the idea of transportation from an individual to a global perspective. Detail of Epoch by Patrick Nagatani. A photo collage mural in the Metro HQ Boardroom lobby presents the idea of transportation from an individual to a global perspective.